Hospital patients are used to wearing wristbands. But now those bands have gone high-tech. 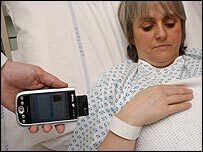 In a scheme at Birmingham Heartlands Hospital, day case surgery patients carry their personal data on electronic tags embedded into wristbands. On arrival, they have a digital photo taken and that, plus the details of the care they need, are loaded on to an electronic tag contained in a wristband they can wear throughout their stay. The tags mean any member of staff caring for that patient can read the tag details using a PDA to check they are treating the right person. They can also see what checks the patient has had, or if they are ready for surgery, to ensure they get the right drugs, tests and operations via the checklist on the PDA. Schemes such as this, which tag patients, and bar-coding drugs and hospital equipment, are being seen in a number of UK hospitals. But the Department of Health is now recommending such technology is more widely used. It has agreed a deal with a company which provides the unique numbering systems which are needed to track patients, drugs or equipment. It means any hospital which does introduce bar-coding or tagging should adopt the GS1 system. The Birmingham scheme was the idea of ear, nose and throat (ENT) surgeon David Morgan. Ten years ago, a colleague performed the wrong procedure on a child. The patient was unharmed, but the mixture of human and system errors which led to the mistake prompted Dr Morgan to decide there must be some way of improving patient safety. A chance conversation with a friend who worked for Tesco revealed that the supermarket used a system called RFID (radio frequency ID) technology to track DVDs and prevent thefts. Mr Morgan then decided to look into whether that could be adopted in a hospital. "Tagging allows you to match IT to the patient; where they are and what stage in the system they are at. It also makes it much easier to verify what checks they have had." A pilot of the tagging scheme started two years ago. Since then, 250 ENT day-case patients have used the wristbands. Mr Morgan said patients were happy. "They had no objections because this showed we gave patient safety a high priority, which made them more confident about the care they were receiving." Staff dealing with the tagged patients have access to PDAs with which they can scan the bands and also access patient details, via wifi, from a secure area on the hospital's central computer system. A 'traffic light' system flashes up when a patient is ready for their operation, and as they go through the theatre doors, a sensor reads the barcode on their wrist and their details are displayed on the theatre's computer screen. If a biopsy is taken during surgery, the system can generate a pre-printed label with the patient's unique code. The wristbands use radio frequency ID (RFID) technology, which can be read via the PDA scanner. Dr Morgan and his colleagues decided to fund a project themselves, which led to a company - Safe Surgery Systems - being set up to promote the technology in 2005. To equip two operating theatres and two wards, the cost would be around £75,000. But the improvements in efficiency mean an operating theatre could carry out one extra minor operation, such as grommets, per day or a slightly more complex procedure, such as removing tonsils. This could save the hospital up to £260,000 a year. The success of the pilot has meant the scheme is now being expanded to cover the ear, nose and throat and chest units at the hospital before the system is rolled out to the other two hospitals in the trust. Health minister Lord Hunt said: "There is evidence of real improvements to patient safety when coding systems are used to match patients to their care - fewer medication errors, a reduced risk of wrong-site surgery, a more accurate track and trace of surgical instruments, equipment and other devices, and much better record-keeping." Michael Summer, chairman of the Patients Association, welcomed the department's backing of ID technology. "We think this should be approved and rolled out because it's going to benefit patients and improve safety. "There have been examples of patients having the wrong limbs removed and the wrong drugs being given and so this will give added protection. "I think patients will go for it because it will be explained to them that it's for their safety."